Mixing Light, with its well-known training and educational website featuring courses on the entire spectrum of color correction for moving images, has published a free three-part tutorial on the Academy Color Encoding Specification (ACES) designed so that colorists can understand the specification and how it will impact their workflow. ACES, published by the Academy of Motion Picture Arts and Sciences (AMPAS), is a global standard for motion picture and television production encompassing imaging, interchange and archiving designed for visual consistency throughout production, VFX, post, and archiving workflows – so that everyone sees the same image, no matter where they are located. 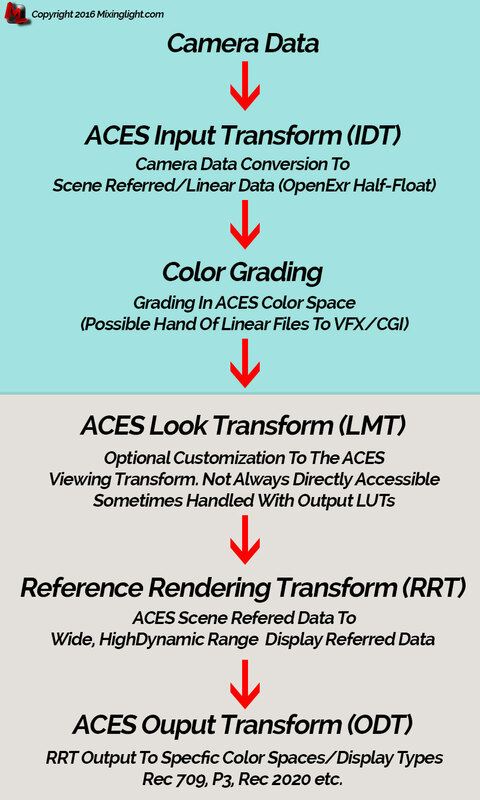 As ACES becomes the industry standard for managing color throughout the lifecycle of a motion picture or television production, it has also proven itself invaluable in solving the problems that arise from using a variety of digital cameras and formats within a single production, as well as worldwide collaboration using digital files. ACES is future-proofed, as its color space is so large that it actually encompasses the entire visual locus — or everything that humans are capable of seeing. Is ACES Right For You? The free three-part primer on ACES, starting with part one — “Getting To Know ACES” — is available at mixinglight.com/portfolio/getting-know-aces/ which contains links to the other two free sections.Additional information on ACES can be found at www.oscars.org/science-technology/sci-tech-projects/aces and acescentral.com. Caption: The ACES pipeline can be broken down into two halves — scene referred shown in turquoise and display referred shown in tan.